My first completely non-photography related "must-have" - Wegmans Food Market (or read about it on Wikipedia http://en.wikipedia.org/wiki/Wegmans). Wegmans is like my guilty pleasure. I love going there. When I go, I spend too much time there and buy too much stuff. For those who are wondering how a grocery store can be a "must have", well they obviously haven't been to Wegmans. What is so great about it? 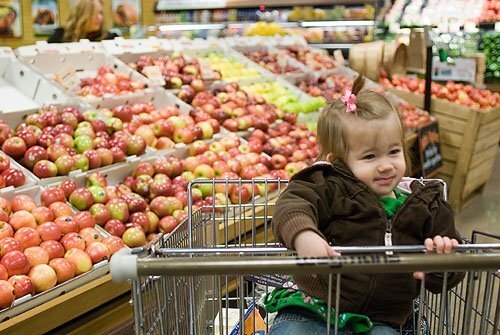 Well, there is a huge produce selection, the specialty desserts are AMAZING, there is a great natural & organic section and really that's just the start of it. I tried to take pictures of the delicious sub (Wegmans comes from Rochester NY, they are subs, not hoagies) and the fruit tart, but I am not good at product photography. So you will have to take my word for it. Or, better yet, find the closest Wegmans and try it yourself. 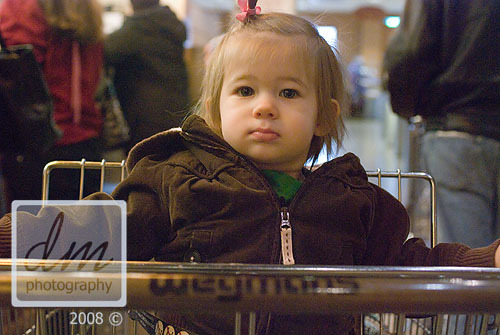 Here's a snapshot of Grace at Wegmans...looking very confused and wondering why I have a camera at the grocery store. And here she's thinking "Stop embarressing me and put that camera AWAY!"